The Best Local 24 Emergency Locksmith Near You For Car, Home, and Business Lock Issues. When you’re in an Emergency, don’t panic. We’re a real locksmith and we’re here to help. Star Locksmith in Giddings, TX is central Texas’ most established and respected locksmith, providing 24-hour emergency automobile locksmith services for more than 30 years. For unlock car services, we are second to none in response time and fast key replacement services at affordable rates. Residents of Giddings, Lexington, LaGrange, Carmine, and the surrounding areas have come to rely on our professional locksmith services for decades. If you ever find yourself locked out of your vehicle, at any time, call us immediately and we will quickly get you back on the road without the pain of absurdly high costs. We specialize in helping customers that are in a lock emergency. There’s no need to panic…just call us! If your locks and keys are sticky or not working smoothly, that could be a sign of an emergency to come. We provide preventative maintenance that will extend the life of your locks. Call us anytime for 24 Hour Emergency Service. We work on a huge variety of residential, commercial, and automotive locks. We want you to be safe! With our full array of services you can call us for all your key and lock needs. In addition to our 24-hour emergency vehicle services, we are the locals’ choice for key duplication services. In fact, our vast knowledge of keys allows us to rapidly duplicate or clone virtually any model/make of car, tractor, boat, recreational vehicle, even lawnmowers in short time, and at low costs. 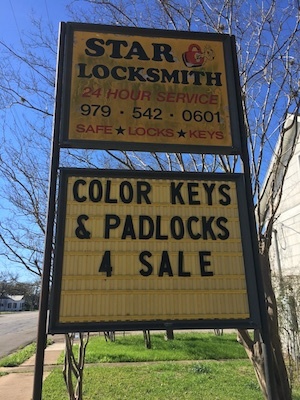 If you are a resident of the following towns, Star Locksmith in Giddings TX is at your service 24 hours a day, seven days a week for your home, business, and automotive security needs: Giddings, Lexington, LaGrange, Carmine, Warda, Lincoln, Dimebox, Caldwell, Round Top, Paige, Burton, Ledbetter, Somerville, Smithville, Deanville, Plum, WestPoint, Winchester, Blue, Tanglewood, Fedor, Serbin, Northrup, NailsCreek, Ellinger, Fayetteville, BirchCreek, Warrenton, McDade, Lyons, Hills, Manheim, Waldeck, Nechanitz, Walhalla, Oldenburg, Rutersville, Frenstat, Kirtley, Muldoon, Winedale, and Old Dime Box. Star Locksmith is your local, licensed locksmith and your satisfaction is our #1 prority. When you need auto, home, business, or emergency lock service we're ready to go to work for you. 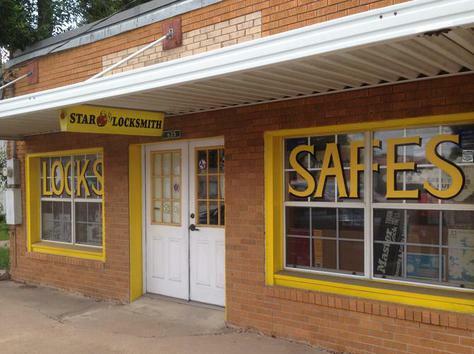 Star Locksmith of Giddings, Texas is a licensed, insured and bonded locksmith proudly serving the central Texas region since 1982.